Being an avid traveler all my life and working in the travel industry for nearly 10 years, I truly believe that everyone should consider travel insurance. As a travel and finance blogger, I’m very budget-conscious and would not recommend something I didn’t believe in. The last thing you want for a trip you’ve been saving for, planning and dreaming of taking is to think about something going wrong. But friend, it happens. I’ve seen people lose thousands of dollars because they didn’t buy travel insurance. And that can create a financial burden, not to mention ruining your trip! Travel insurance is meant to protect your financial investment, if something goes wrong. Meaning if you have to cancel and can’t get a refund by the airline, hotel, rental car, etc., you submit a claim to your travel insurance company to reimburse you. Just like your car or home owners insurance, it costs money but you pay for that peace of mind. Now I know I said travel insurance is complicated, and I don’t work in the industry, but I sure know a lot based on research and experience. Plus, I personally purchase travel insurance for trips every year! So, let’s get into your guide to answering your question: Is travel insurance worth it? 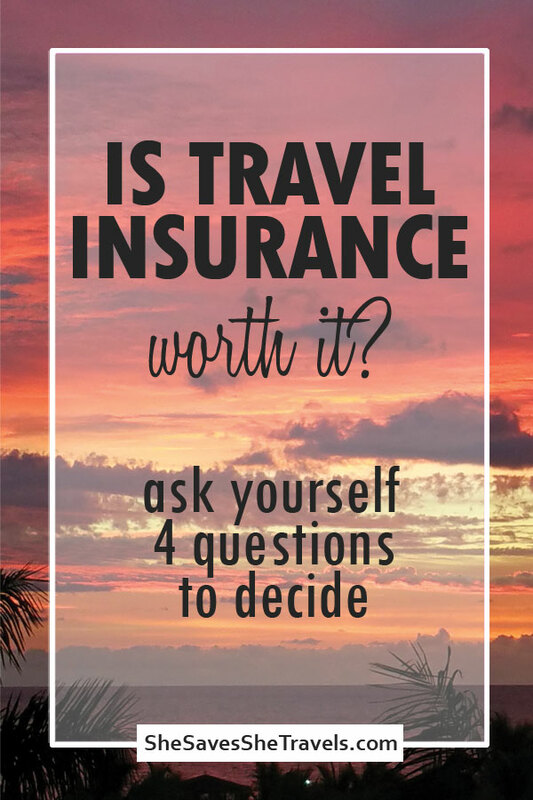 Start with answering the following questions to help you make a choice on if you should buy travel insurance. After that, read through the guide to get a better understanding of the cost of travel insurance, when to buy it and more. Is travel insurance worth it? Answer these 4 questions to find out. 1. How much does your trip cost? If it’s a large investment and you’re not willing to lose that money, then your answer is yes, you should buy travel insurance. If your trip cost is low and you’re not worried about losing that money if you have to cancel, you can pass on travel insurance. Let’s say you are taking a 10-year wedding anniversary trip to Africa. (You’ve always dreamed of going on a safari and getting the real experience!) You’re probably paying for overseas flights, accommodations, various transportation, a tour company and more. So that adds up. If you’re paying all or a portion of those things up front, you’ll want to consider buying travel insurance. On the flip side, let’s say you’re traveling to your aunt Sally’s for an extended weekend getaway. If you are driving across state lines to get there, or even if you purchased low-cost flights, you could probably take a gamble with that small investment and can skip travel insurance. So ask yourself: is the price of the trip high enough that you would be really upset if you had to cancel and you lost that money? 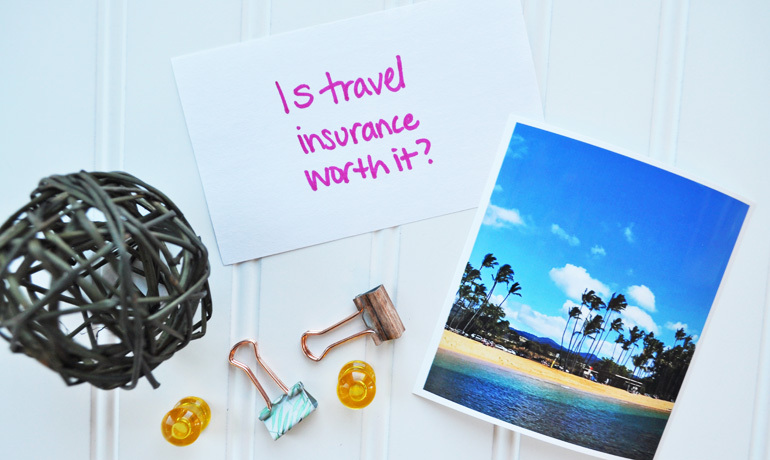 If your answer is yes, you need travel insurance. 2. 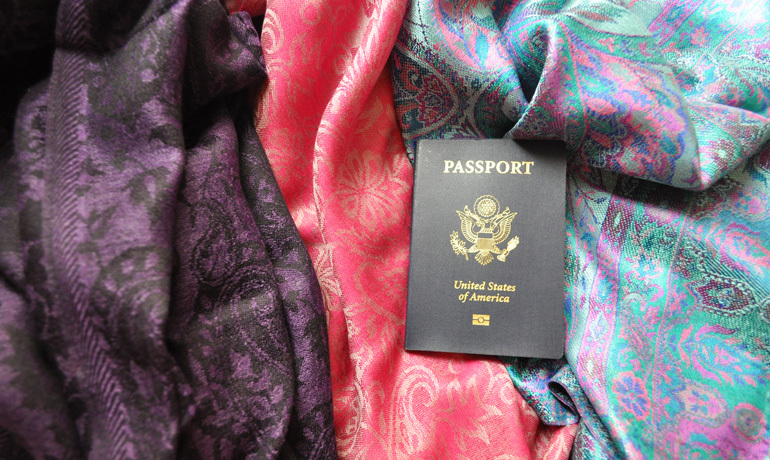 Are you traveling internationally? 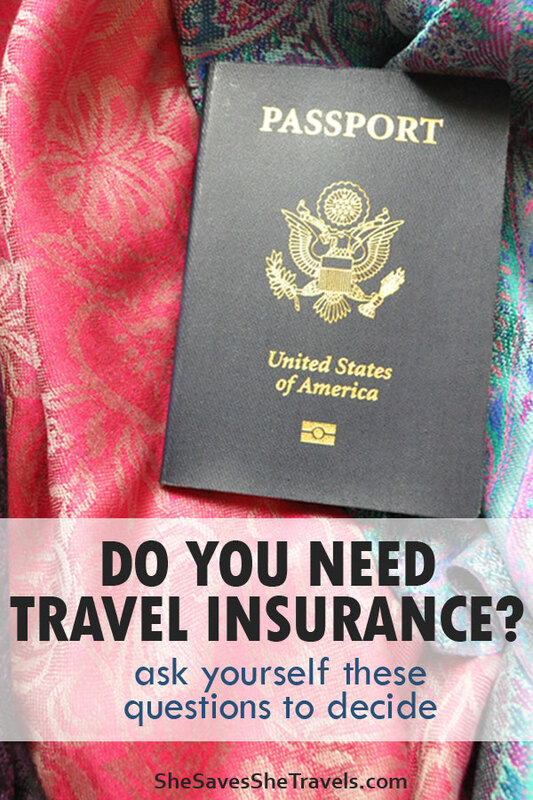 If your answer is yes, you need travel insurance. Good travel insurance plans offer medical coverage if something happens to you during your trip. Your regular U.S. based health insurance plan provides limited, if any, medical coverage internationally. Any travel insurance plan that does not cover medical expenses is not worth your money! So, let’s say you are going to Italy on your honeymoon. (So exciting!) You get there and are walking the famous cobblestone streets, when you fall and break your ankle. Travel insurance has your back! Or worse, you are traveling to one of the remote islands of Greece with your extended family. Suddenly your father-in-law suffers a heart attack and has to go to the nearest hospital on the mainland for treatment. Medical evacuation via helicopter can cost tens of thousands of dollars. This is the time you’ll all be glad you purchased travel insurance! 3. Do you have a complicated itinerary? If you have multiple destinations with numerous layovers or travel operators, travel insurance is right for you. Okay, so you’ve booked a family cruise to the Caribbean. You have to fly into Miami, where the ship leaves the port. Your cruise is a 7-day Caribbean dream trip. But unfortunately your flight doesn’t make it into Miami in time and you miss the cruise ship’s departure. Now you’re stuck with disappointed kids and you’re out the cost of the cruise too. If you have travel insurance and the flights were delayed by a covered event, you could get reimbursed the cost of your cruise. Or let’s say that you book all your own trips. You search the internet for flight deals using multiple airlines to travel from the U.S. on a 3-week trip to the best beaches in Asia. You leave from San Francisco and are heading to China for a few days. Then you head over to the Philippines before spending time exploring various islands in Indonesia. This many airlines and accommodations all need to align perfectly to make sure you have the trip of a lifetime. You’ll want to buy travel insurance in case a flight is delayed or you have an issue with a travel company. 4. Have you or an immediate member of your family been sick or injured recently? If you have a member of your family or yourself that has a long medical history, or whose health is deteriorating, you need travel insurance. This part of travel insurance is really tricky, and every travel insurance company and policy is different. Just know that health is a reason for buying travel insurance. I encourage you to call the travel insurance provider with questions. 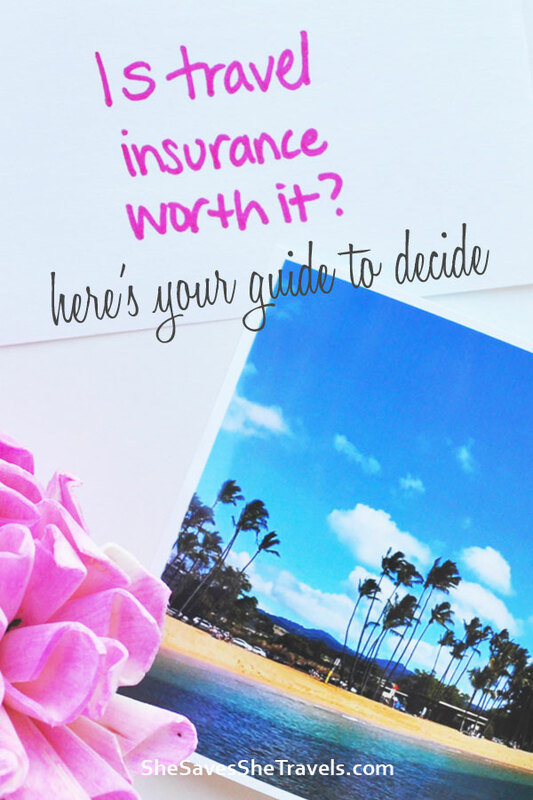 Okay, so you could be leaning either towards or against insurance for your next trip. Before you decide, you’ll want to keep reading. We still haven’t talked about the cost, when to buy and what to look for in a travel insurance plan. If you’re still trying to answer your original question, “is travel insurance worth it?” then keep reading on. Travel insurance works like other types of insurance, where the provider takes a bunch of factors into consideration and you’ll get a custom quote. Each insurance company takes on a certain amount of risk, and they base the price of the policy accordingly. Let’s break each area down and why it matters. Typically the lower the trip cost, the lower the cost of travel insurance plan. If you think about it, if you need to cancel a $15,000 trip the insurance company would be out more than if you cancel a $2,000 trip. This one is easy to figure out – but not necessarily fair. Usually the younger the traveler, the less money the travel insurance plan will cost you. Because a 85-year old traveler is theoretically more likely to need medical care on a trip than a 25-year old traveler on the same trip. So, not really fair but it’s all about risk to the insurance company. Oh, and some travel insurance plans include coverage for kids for free. Different travel insurance providers factor trip length in differently (some not even considering it at all). Most will have some type of limit of days on a single-trip plan. For example, a single trip plan might have a maximum of 60 days for one carrier, and 180 days for another. This is because there’s more risk involved. The travel insurance company would want you to purchase an annual plan instead of a single trip plan (more on that in a bit). Different states and countries have insurance laws, and travel insurance companies have to comply with those laws. So each insurance provider is going to handle your residency, and who they will cover, differently. Some insurance companies can insure you if you’re living on any continent on the globe. Others are only able to insure you if you are from the U.S., UK, etc. The ability to insure you can impact the price, thus the reason it’s asked at the time of a quote. Okay so I mentioned earlier there were some companies that provide travel insurance with no medical coverage (don’t do it!) and that there are policies you can buy that include extra coverage. Here’s the thing: you’re always going to pay for what you get. Don’t cheap out too much or your policy won’t be worth anything if you run into an issue on your trip or if you have to cancel. The cost of travel insurance varies based on the factors above. In general I budget 5%-10% of the trip cost when preparing for a trip. To calculate your trip cost, think of the big components of the trip, such as airfare, accommodations, rental cars or anything else pre-paid like activities or tours. Then it’s super easy to get a quote. Factor that into your travel budget before you even start booking your trip. Trip cancellation (and interruption). Like the death of a loved one or you break your arm the day before you leave. 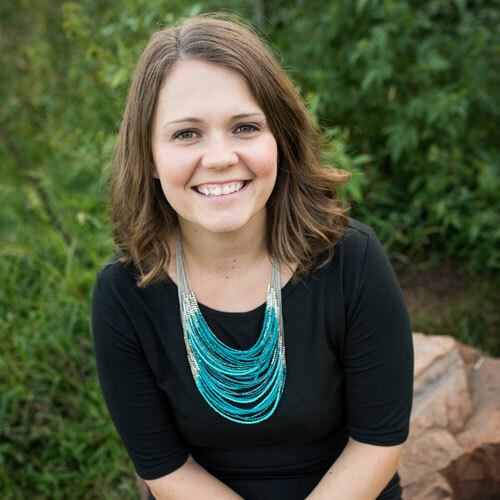 Emergency medical expenses and evacuation. You get sick or injured while on your trip and need medical attention. Travel delay. Like a blizzard in the middle of winter prevents your plane from taking off until hours after it’s supposed to. Lost/stolen items and luggage. Whether it’s the airline who loses your luggage or a pick-pocket snags your wallet while visiting the Eiffel Tower, your travel insurance policy can help cover the replacement costs. Primary coverage. Since you get what you pay for, keep in mind that some travel insurance policies will require you to pay a deductible on a claim before they pay out, just like your car insurance. However, the best policies don’t require that (makes sense since you already gave them money). The five areas above are the main benefits to look for in a travel insurance plan. But honestly there’s so much to travel insurance that I’ll just recommend that you read the fine print to make sure you’re covered for everything you need. Each travel insurance company covers situations differently, so ask your specific questions to the company before buying the plan. Can I buy travel insurance for multiple trips? Or is it cheaper to buy annual travel insurance? Travel insurance can be purchased a few different ways. The most common way to buy travel insurance is for a single trip. 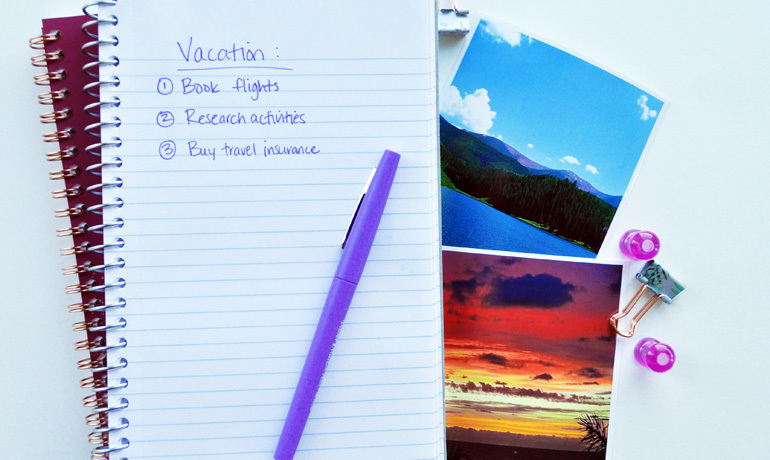 So each time you book a vacation, factor travel insurance into your budget. If you travel several times a year, you could look at an annual travel insurance plan. The benefits can be different, especially when it comes to trip cancellation benefits. As always make sure you read the fine print. Depending on the types of trips you’re planning, it may take 3-4 trips of buying a single trip travel insurance policy before an annual plan would be worth it financially. You can also buy travel insurance for business travel (or have your company do it for you). This would protect the company you work for from their investment for trip cancellation reasons. It would protect your personal items during your travels. What if I already have travel insurance through my credit card? To be honest, this may be all you need if you have a travel credit card and the benefits are very robust. A few of the top travel insurance credit card programs provide some benefits for trip cancellation, medical expenses, travel delay and lost luggage. However, there will most likely be gaps in benefits versus a third party travel insurance company. 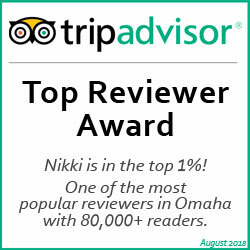 I have one of the best travel rewards credit cards available with pretty good travel insurance benefits. I still buy travel insurance through a 3rd party travel insurance company. The independent travel insurance policy I usually buy allows me to cancel for more reasons, provides better medical coverage (especially medical evacuation), covers theft, and a bunch of other detailed items. Note that most travel insurance plans through credit cards will require you to pay for all of your travel with that card in order to be covered. For example if you used airline points for flights, or used a different card or paid cash for your trip. You may not be able to get reimbursed from your credit card travel insurance if something goes wrong. After researching, if you find that the simpler travel insurance benefits offered through your credit card will work for your trip – awesome! That’s one less thing to purchase for your next trip. What about that insurance when you buy your flights? Does that count? Nope! Many airlines will offer travel insurance as an add-on when you check out on their website. Usually if you buy the travel insurance, it usually only covers a portion of the trip (like just the airfare). Or it includes a fraction of the benefits as full third-party insurance. Buying that insurance is better than having nothing at all, but it can be overpriced and not worth it in the long run. Does travel insurance cover everything? Nope! This blog is full of honest experiences and reviews, so this is a great time to mention that you will never be 100% covered for every situation when you buy travel insurance. Just like a home owner’s insurance policy, there are things that travel insurance simply doesn’t cover. For example, if your flight to Madrid takes off at 6:05 am and you accidentally oversleep, waking up at 5:30am, you’re obviously not making it to the airport in time and you’re out of luck. You’ll have to rely on the airlines (or your travel agent) to help re-book your flights and your insurance probably isn’t going to pay for the cost of that change. Now, if you were late to the airport because you were in a car accident, that’s when your travel insurance policy would come in to save the day. Or let’s say your best friend’s mother passes away and you feel you should cancel your family vacation to Kauai to support your friend during this difficult time. This likely wouldn’t be covered under a regular policy either. However, let’s say your trip was actually a girl’s trip to Kauai, including your best friend and two others. If you all purchase insurance, you likely could have all cancelled to support your friend because most insurance policies cover death of an immediate family member, and cancellation for traveling companions too. It’s important to note that travel insurance is extremely helpful for protecting yourself and your investment, but just like all insurance policies, there are limitations. There’s going to be a list of commonly covered events, and a list of excluded events. If you want to be super thorough in your research, you’ll find both lists for multiple companies and compare them to find the best one for you. However, most major insurance carriers will have similar lists. 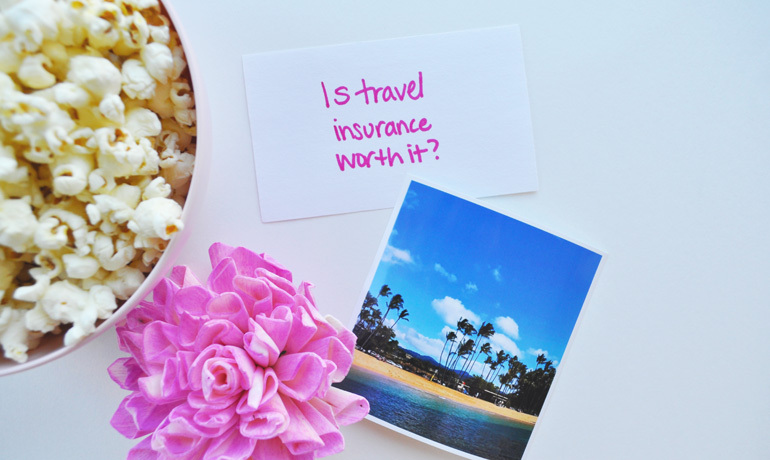 Just checking in… have you answered your big question yet: is travel insurance worth it? Let’s keep going. So, when should you buy travel insurance? You’ll usually get the most out of your travel insurance policy if you purchase it as soon as you pay for anything on your trip (like flights) or put down a deposit toward your trip (such as paying for the first night’s hotel). Some travel insurance companies will have a period of time (like 10-30 days) to buy the policy in order to get the best benefits, specifically when it comes to pre-existing conditions. The first thing to do before you leave for your trip is to print travel insurance documents and take them with you. Your travel insurance will come with a phone number to call if you have an emergency while traveling. Put that emergency number in your phone. In an emergency, it’s important that you call them for assistance as soon as you can because the travel insurance company has specific companies they work with to provide services. Plus, it’s less stressful to arrange things yourself. Keep all documentation and receipts. This is super helpful if you need to file a claim. For example, travel insurance covers things like personal hygiene items and an extra set of clothes if the airline loses your bag. Make sure to document any change fees from your airline if you miss your flight for a covered reason. If you do have to file a claim, the process shouldn’t take too long with a reputable travel insurance company. Be sure to submit everything promptly so you can collect your refund. Have you decided? Is travel insurance worth it? 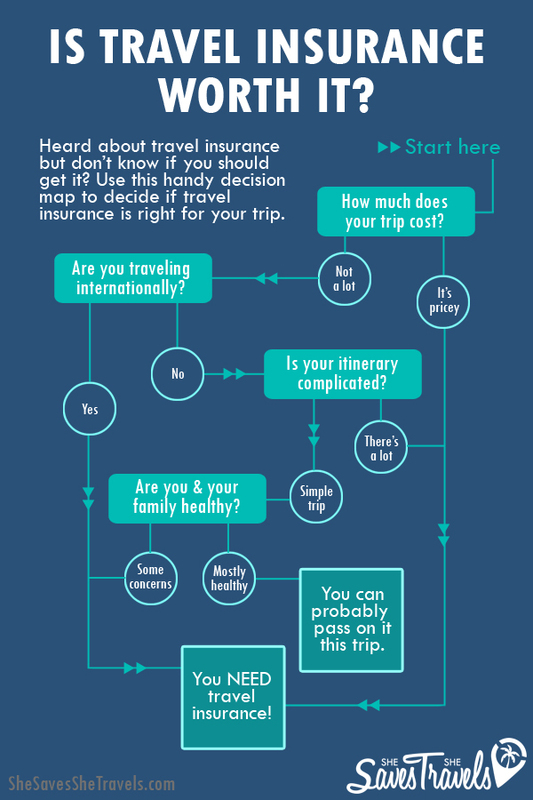 This travel insurance guide was extensive and if you got lost somewhere in the middle, here’s a summary for you! Travel insurance is meant to protect your financial investment for your trip. Depending on your policy and travel insurance company, they can also provide resources for you while you’re on your trip (like arranging medical assistance). Check out pricing for a travel insurance policy for your next trip, and make sure you’re comfortable with the benefits you’re paying for. If you purchase travel insurance hopefully you won’t encounter any issues and you have a fantastic trip. But in the event something does happen, it’s nice to know you’ve bought travel insurance for the big stuff. So, what do you think of travel insurance? Love it? Hate it? Going to try it out? Comment below! Thanks so much, Divya! I hope it’s a good resource for your next trip. Safe travels! This is useful information! We have always had travel insurance when traveling out of the country. Thankfully, we have never had to actually use it. I hope it stays that way for all of our traveling days! Either way, I plan to continue to make sure we have insurance for our entire family when traveling. That’s so great, Sherry! I’m glad you haven’t had to use it. I always feel better leaving the country when I have travel insurance, too! Absolutely! That’s a great way to look at it, Quita. I hope you never have to use it! I had never even thought of travel insurance…until now! Thanks for the great tips! No problem, Konner. Glad you found the info helpful! I would add that if you have small children you should always buy travel insurance whether they travel with you or not. My husband and I once had to cancel a long weekend trip (without kids) because our little one got the flu 2 days before we were supposed to fly out. We prepaid for hotel, flights & tickets for entertainment and lost hundreds of dollars because we didn’t have travel insurance. Now we always buy it just to be safe. It may not cover all costs but it’s better than nothing. That’s a great point Tiffany. There’s so many reasons to buy travel insurance – having kids is definitely one of them! I’ve always just purchased the insurance offered by the airline. I did not realize there are other companies offering benefits. Thanks you for the informative article. I have been considering buying medical for my upcoming trip to Vietnam. When I was there last year, an Australian visitor spent 5 days in the hospital and her insurance covered it all. You are so welcome, Amy. There’s so many benefits to 3rd party insurance beyond what the airline offers. Safe travels on your upcoming trip!